K-Town may have a stranglehold on the best Korean BBQ in LA, but let's be honest: in LA, often the "best" is less important than "the best that doesn't involve an hour of traffic on the 10". 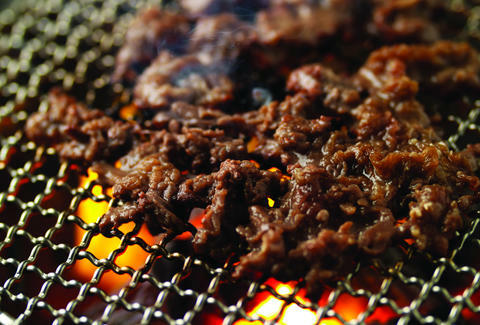 So, West-of-La Cienega friends, take note: here're the top nine Korean BBQ spots in your neck of the woods. This traditional joint's a little smaller and older than Seoul House (which is just down the block), but its bill will set you back a little less, and its meat (think succulent cuts of Kalbi served on a sizzling hot plate over a bed of sliced onions) is no less tasty. If you're willing to put up with the occasional long line of people wearing baby blue, this cash-only stand just down from In-N-Out serves perfectly charred pork belly, bulgogi, Kalbi, and chicken, as well as hefty portions of stir-fried japchae (Korean glass noodles). Tabletop grills? Check. Generous banchan portions? Check. 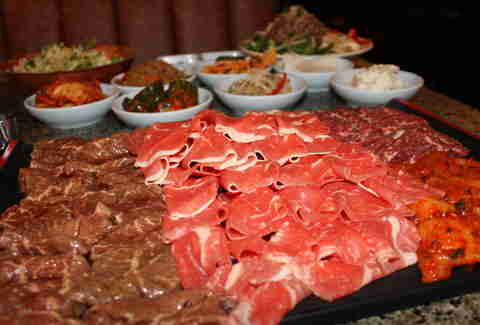 All-you-can-eat heaping plates of meat? Chizzeck. For $17, this strip-mall joint (that used to be Tofuya Korean BBQ & Grill) serves up all the savory, tender bulgogi, pork belly, and beef tongue your stomach can handle. Bonus points for ample parking and being the only AYCE spot on the Westside. 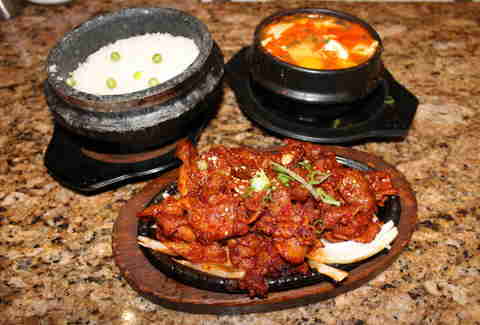 Think of Bibigo as the Chipotle of Korean cuisine. 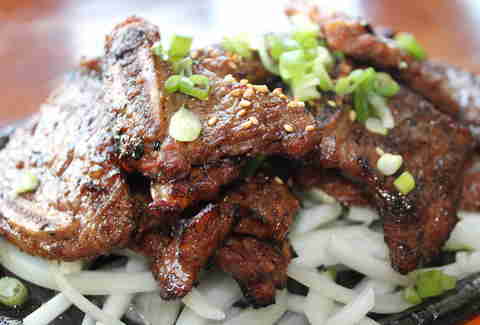 But instead of carnitas, they've got char-grilled bulgogi and braised short rib. 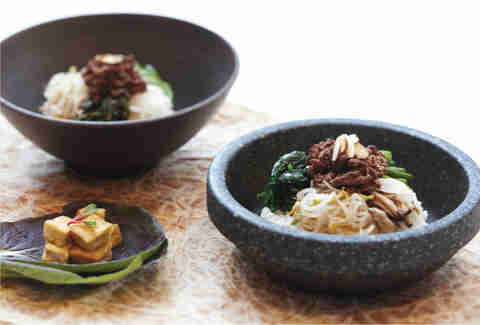 And instead of tailor-made burritos and bowls, they've got customizable bibimbap (a traditional rice dish topped with veggies, egg, and chili paste) with the option to swap out plain rice for the chewy, nutty, insanely delicious black rice. An actual date-friendly Westside KBBQ spot, Wharo uses charcoal instead of gas tabletop grills, which adds to the rich, smoky flavor of its prime chuck Kalbi and thin-sliced brisket. 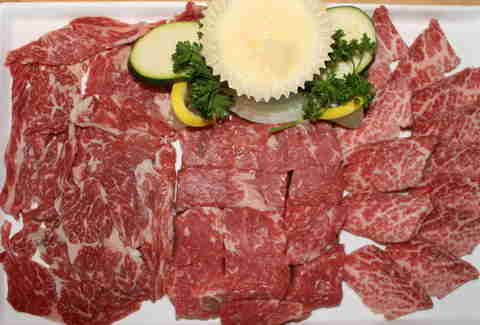 If you have cash to burn, get the kobe combo: a platter of marbled, fatty beef shipped from a ranch in Idaho. This little stand on Santa Monica Blvd isn't about upholding tradition. 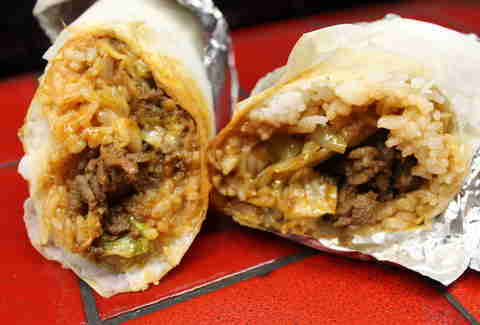 Though its three BBQ plates are hearty and flavorful, if you like your bulgogi on-the-go, they'll serve it in a substantial burrito jammed with rice and cabbage. Also worth hitting? The spicy, tangy kimchi fried rice. Ignore the absolutely terrifying name; when you've got a craving for BBQ, this Sawtelle establishment will hit the spot. Try its spicy pork 'gogi, which tastes like it's been marinating in slightly sweet chili paste for days, and wash it down with a glass(es) of the light Korean beer, Hite. Leave cloth napkins and Wagyu beef to schmancy Eastsiders. This hole-in-the-wall across the street from SMC is a great find for a grab-and-go lunch. It's run by a friendly, old husband and wife who speak just enough English to take your order, which won't cost you an arm and a leg... unless your arm/leg cost eight bucks. 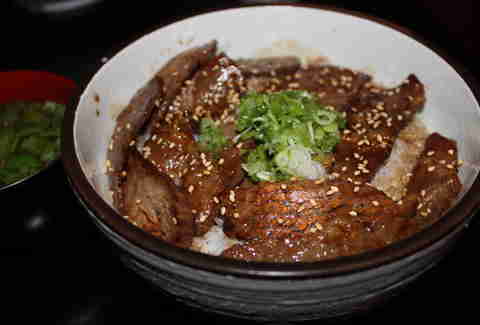 The eight spot will get you a massive plate of juicy chicken bulgogi with a fried egg and miso soup. 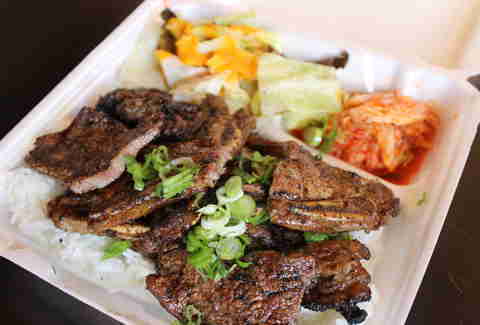 This rare, open-past-midnight Westside spot'll satisfy your post-Arsenal Kalbi craving, with thin slices of the BBQ meat coming a la carte or over a bowl of rice. If, for some dumb reason, that's not what you want, they've also got a slew of other dishes from all over Asia. Although, let's be honest, after-midnight geography's not your strong suit. Tiffany Tse is a freelance writer who occasionally leaves the Westside for great food and concerts. Find her on Twitter at @twinksy or Instagram at @twinksy.